At Azure Support, our aim is to help you in your cloud journey, all the way from initial experimentation to running production workloads on Azure with confidence. Software fails, hardware breaks and you can run into issues when trying new things. That’s why it’s important that you’re able to diagnose and resolve issues quickly. 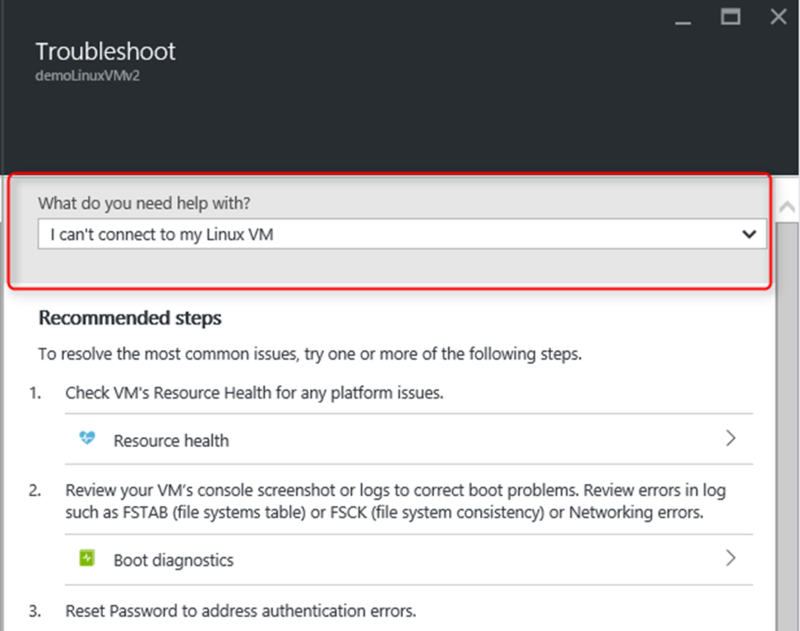 To support those efforts, the Azure Support team is pleased to share new features in the management portal to help you diagnose and resolve issues, find authoritative troubleshooting resources (tools, guided steps and articles) and easily get additional help as needed. Within each resource’s Settings blade, you can now find the “Support + Troubleshooting” section. This section provides quick access to tools and resources to help you diagnose and resolve issues and receive additional assistance. You can discover common diagnostic tools in this section such as the Troubleshoot blade or open support requests from the resource context. We added the Troubleshoot blade to help you discover and apply authoritative solutions to common issues. You can access the Troubleshoot blade from the “Support + Troubleshooting” section within a resource. On the Troubleshoot blade, you can select from any one of the listed issues to view a corresponding solution. The solution consists either of guided steps or links to authoritative Azure articles describing how to diagnose and resolve the issue you face. The solutions are contextualized based on the resource. For example, in the case of the virtual machine, the solutions are shown based on the operating system that’s running on the virtual machine and the resource deployment model (Resource Manager or Classic). If your issue is not listed or if the solutions don’t help you resolve your issue, you can contact the Azure experts on the MSDN Azure and Stack Overflow forums or connect with us on Twitter @AzureSupport. 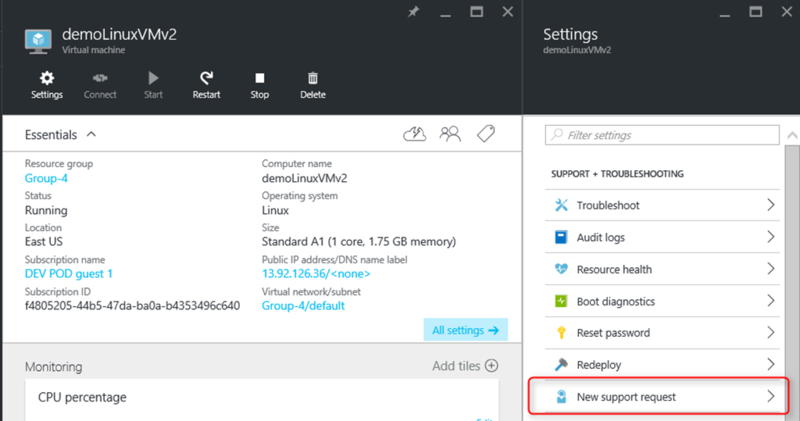 Alternatively, you can file an Azure support incident through the Azure Support site (select Get Support). The Troubleshoot blade is currently available for Virtual Machines, Storage, Express Route, Web Apps, SQL Database, Automation and Redis Cache. We continue to expand our troubleshooting coverage across products and to update existing products with more automated solutions. In the “Support + Troubleshooting” section, we added the “New support request” option. This lets you submit a support request. The resource context and details are then automatically captured and passed to the right support engineer for fast resolution. If you do not have a support plan, you can contact the Azure experts on the MSDN Azure and Stack Overflow forums or connect with us on Twitter @AzureSupport.